Which book is best for me to buy? 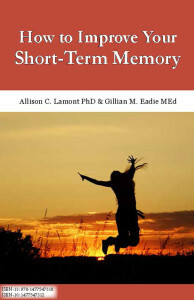 Memory.Foundation has a number of helpful books by Dr Allison Lamont & Gillian Eadie. Do you want a Real book or an eBook? If you prefer a high-quality paperback book, two titles are available. 7-Day Brain Boost Plan is the latest glossy paperback and it covers the basic information you need about the brain and memory and practical tips for improving each type of memory. As the title suggests, 70+ pages are devoted to a day-by-day guide to the exercise, brain food and brain challenges you need to set yourself up for healthy brain habits. Each day spans from your wake-up stretches at 7 am (or when you usually arise) until supper and wind-down at 10 pm. This has been a very popular title because the larger print is easy to read, the plan is easy to follow and the entire focus is on creating a brain-healthy lifestyle. Don’t Lose Your Memory! 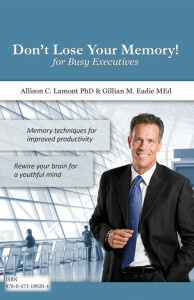 For Busy Executives This business-focused title is available as a glossy paperback through Amazon.com. It has been popular because of the clear writing style, no-nonsense focus on the basics and exercises that are easy to incorporate in a business day. 32 pages packed with problems, puzzles and challenges as well as some guides to problem-solving and great tips from other Brain Tuners. A quick, easy to read, 32-page guide to this memory issue. As the title indicates, this eBook focuses on the nutrition your brain needs (and doesn’t need!) 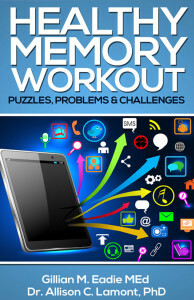 as well as ways to enhance your memory functioning. This eBook is a godsend if you, or someone close to you, is facing the challenge of coping with Alzheimer’s. 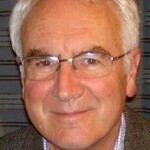 Some of the topics covered include: What are the worrying signs? How did we know this was Alzheimer’s? Practical things like which clothes are best, Tips for communicating and helping him/her to remember, How to cope with difficult behavior, How to keep him/her amused and engaged all day. What's the difference between Memory Tune and the 7-Day Brain Boost Plan? PayPal is a worldwide, online bank. It enables buyers and businesses to send and receive money online. PayPal has over 100 million member accounts in 190 countries and regions. It’s accepted by merchants everywhere. Yes! PayPal helps protect your credit card information with industry-leading security and fraud prevention systems. When you use PayPal, your financial information is never shared with Memory.Foundation or any other merchant. You can make purchases or send money with PayPal – it’s free and you don’t need to have a Paypal account to shop at Memory Foundation. If you are a New Zealand resident and you would rather not use Paypal, the other options are to transfer the money to the Memory Foundation bank account via a bank transfer or send us a cheque. Once the money is received, we will process the order. 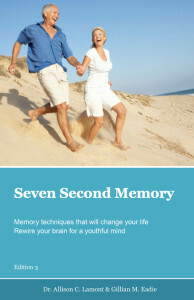 Healthy Memory Company Ltd, 20 Glen Atkinson St, St Heliers, Auckland 1071. Can I pay by credit card without a Paypal account?